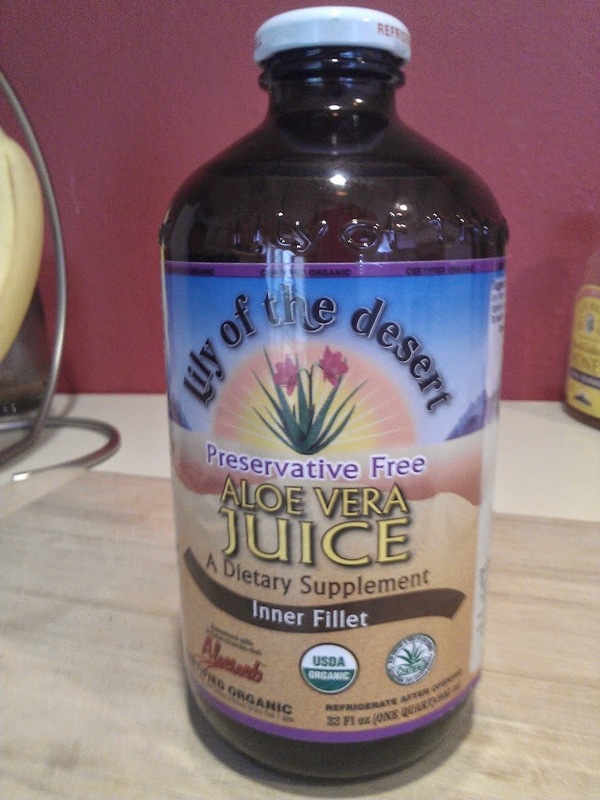 Giving Aloe Vera Juice a Shot…. On my last shopping trip to the health food store I noticed a sale on aloe vera juice. After a brief pause of consideration, I put a bottle into my shopping cart. I know that aloe vera juice is good for digestion and honestly I’ve had a bit of an issue with this of late. Things have been…. well…. slow moving, Lol. This morning I added a tablespoon to my smoothie (see recipe below). When I took a sip I could definitely taste the aloe. Not horrible, but definitely took some getting used to. After drinking up the smoothie I took a moment to revisit the benefits of drinking aloe vera juice for endometriosis and common ailments that come along with endo. Aloe vera is an adaptogen, which means that it helps boost your body’s natural ability to external changes and resist illness. It also allows for your body to cope with physical, emotional and environmental stressors. Aloe vera juice also offers calcium, magnesium, zinc, chromim, selenium, sodium, iron, potassium, copper and manganese. It also contains about twenty different amino acids and fatty acids. In a nut shell — It offers much of what your body needs to heal from endometriosis — including the enhancement of liver functioning. It is said to help out bad estrogens, helping to bring your hormones back into balance. My primary reason for picking up some aloe vera juice was because it soothes and cleanses your digestive tract. Aloe vera is a gelatinous plant food, which means it turns into gel in your intestinal tract – helping to move things out, including toxins — Yay! Aloe vera helps balance out bad bacteria in the gut and also helps your digestive tract in the absorbent of vitamins and minerals from your food. It is supposed to help with healing a leaky gut. It has been said to help IBS and acid reflux. For those of you who are also into Ayurveda, aloe vera juice helps calm “Pitta” — it is cooling in your body. Here is the recipe for the smoothie I put together this morning — pretty tasty (once I got used to the aloe) As always, organic is best if you can find it, especially for the berries. I don’t add ice to my smoothies, as I don’t do well with super cold things, but if this is your preference then add ice to make it colder. Aloe vera juice is supposed to help with inflammation in your joints. After drinking my smoothie I did notice a difference in the joint pain I woke with this morning — in my knees and lower back — barely noticeable now. Aloe vera juice is also great for bladder issues. My bladder has been acting up a bit lately (a tie in, I believe to my tired kidneys) and I woke this morning with some discomfort there. After drinking my smoothie, this went away. If you suffer with bladder flares too, then definitely pick up some aloe vera juice. As with most herbs/foods, its best not to over do things. Aloe vera juice shouldn’t be consumed all the time. It is detoxifying and over time too much of it can lead to a loss of essential electrolytes. To fair in the way of caution I wouldn’t drink it for more than two weeks in a row. I also read that it is not suggested to drink it during menstruation. Have you tried aloe vera juice? Notice anything from drinking it? I’d love to hear from you…. It works, I been drinking aloe Vera for years, I had endometriosis but not anymore thinks to aloe Vera juice. Just drink it everyday. That’s amazing! How much did you drink every day? That smoothie sounds amazing! I’ll be picking some up today!